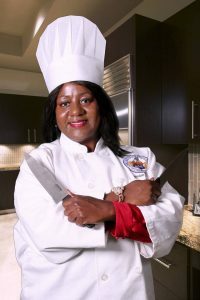 Hello, my name is Denise Riley, A Celebrity Chef from the heart of the “BRONX” and this is my story! My story is no secret .. those who know me, know my mom died about seven years ago. She was diagnosed with Cancer, and later died from a Hip-Operation in New-York City. I was not sure how she died, whether from the Cancer, or the Hip-Operation, once they opened her up. Until I read a Quote about Fear .. and it says.. FEAR has 2 Meanings .. So after several counseling sessions from Dr. Boyd Haynes, who convinced me, time, after time, after time again, I decided to get my surgery done. But in Reality,.. The Operation was a Quick Success. It did not take long! So NOW, I can walk again, without the use of a Cane. Thanks with the help of the staff at “Bayada” Home Health Care Team. And just to think, .. This ALL Could have been done and over with a year ago. I even thought that my body, would have felt a “Void” once my bone would have been removed, But I don’t even feel that way, AT-ALL! My Body feels so Superb, and my surgical leg feels waaay better than my regular leg! .. It almost feel “Bionic” .. Talk about a Super, Human, Being! I almost wish my Mother was alive, so she can be able to see how “SUCCESSFUL” my surgery went. However, I KNOW my mother is in a better place, smiling upon me from Heaven now with the Angels, saying.. “Very-Well my daughter” .. “Good-Job” “You did the right thing”! It’s almost like I can feel her saying that .. because we we’re just that close! So I hope this touches someone who has a Mother who’s alive now, for she is your Creator, who was Blessed by GOD, who carried you in her womb, and gave birth to you. Send your Mother LIVE flowers Today, .. Because she cannot smell them Tomorrow.